Make the ears less pointy, and it’s a lamb! I modified this idea from a magazine. So cute for Easter. What You need: cupcake; white frosting; mini marshmallows; 1 large marshmallow; 2 1/2 pink Jelly Belly jelly beans; 2 mini chocolate chips; kitchen shears. How to Make it: Cut large marshmallow in half widthwise, pinch to form points, and add jelly beans to the sticky sides. Place near top for ears. Arrange mini marshmallows to form rabbit fur. Cut jellybean in half and place for nose. Add two mini chocolate chips for eyes. 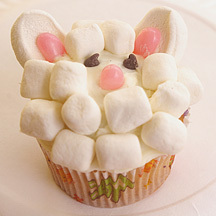 I got this Easter cupcake idea from the Reynolds company’s Web site (Besides foil, they make cupcake liners). Try it with carrot cake! 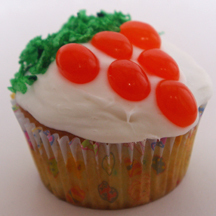 What You Need: 1 cupcake; white (or cream cheese) frosting; 6 orange jelly beans; shredded coconut; green food coloring. How to Make It: Frost cupcake. In bowl or cup, use food coloring to tint coconut green. Arrange jellybeans in triangle shape to form carrot. Sprinkle coconut at the wide top for leaves. Use jellybeans and a round candy to arrange a spring flower and finish it off with piped leaves. 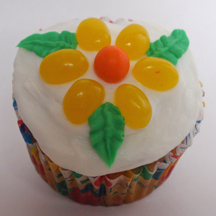 What You Need: 1 cupcake; white frosting; green frosting; 6 yellow (or any color) jellybeans; 1 orange (or any color) candy for center (I used a Runt); pastry bag and leaf tip, or tubed icing with leaf tip. How to Make It: Frost cupcake white. Arrange 6 jellybeans around center candy to form flower shape. Add green leaves. Sometimes, simplest is best. Especially when there’s a last-minute call for cupcakes for the school St. Patrick’s Day party, or for the after-work party where everyone’s bound to be a little tipsy anyway. 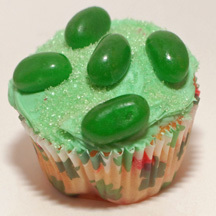 These green jellybean cupcakes add sparkle without taking much time. The St. Pat’s liners are a nice touch, and available from Wilton. What You Need: 1 cupcake; green icing (I used Pillsbury’s holiday frosting); green sugar or sprinkles; green jellybeans (or go smaller with Jelly Bellys). How to Make It: Frost cupcake. Sprinkle with or dip in green sugar. Add jelly beans.